Ah the spanakorizo … This dish was a winter staple in our home. My mom would make it once a week, all winter long. 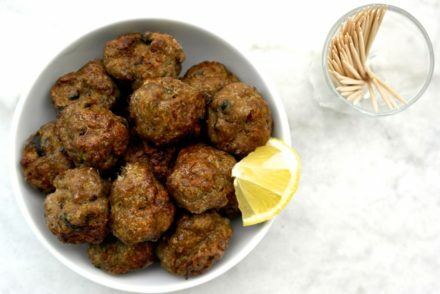 She would usually accompany it with a small cheese pie (tiropitaki) or one or two Greek meatballs, and while you may think that as children we would hate it because of the spinach, it actually was a comfort food. It is soft and creamy, and along with plenty of lemon juice, a bit of olive oil and of course feta, it was delicious (and still is). 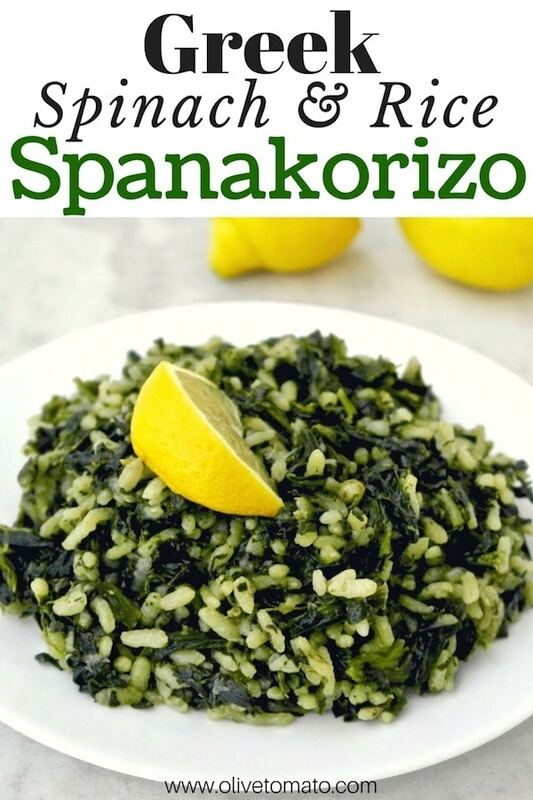 Spanakorizo is such a simple dish as many Greek ones are, but yet delicious and easy to make. Oh, and did I mention its nutritional value? 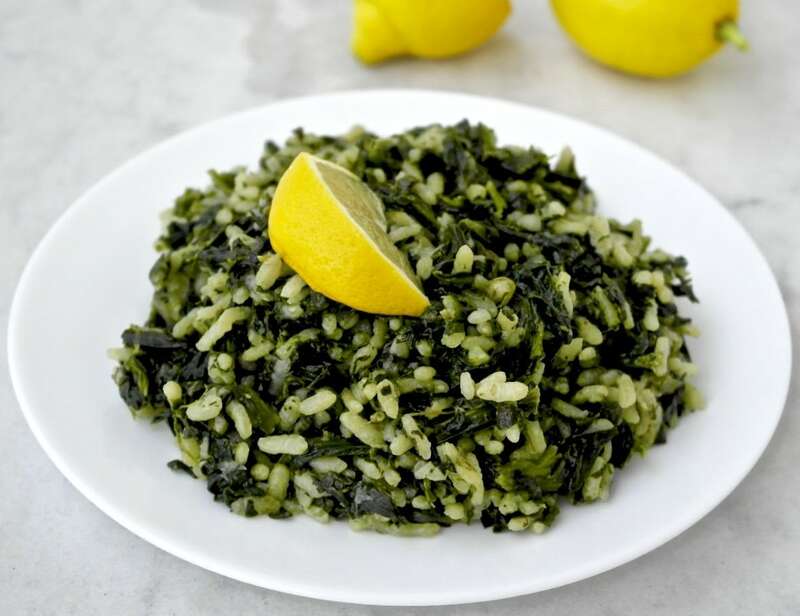 Spinach full of antioxidants and fiber, the lemon helps with some absorption of the iron in the spinach and the rice is a source of carbohydrates to provide sustenance. The actual recipe has little olive oil during the cooking stage, but adding some olive oil while serving makes it even more delicious and the addition of fat helps with the absorption of antioxidants. Now this recipe makes about 2 main course servings, so basically you are getting ½ pound of vegetables in one sitting. The beauty of the Greek diet… getting your vegetables effortlessly. A note about the rice: It is important to use the right type which in this case is medium grain rice. You do not want short grain rice which may end up giving your dish a sticky texture, but not long grain either as you will not have the smooth texture we are looking for in this recipe. As for brown rice, it takes a while longer to cook and as a result you may be overcooking the spinach as well. 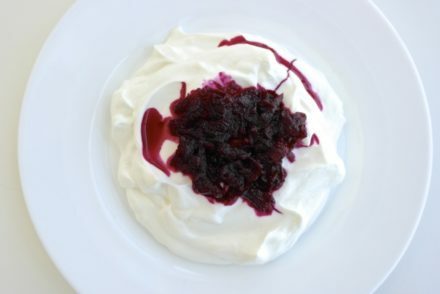 This can be enjoyed plain (without feta) for a vegan dish or with feta. And this is considered a main course, but you may serve it as a side dish. It goes well with fish or beef patties (biftekia). You may add the tomato paste in step 4. I just made this today. Spanakorizo is a staple in our home once a week in the winter– a great way for kids to eat their veggies. I also add leek (prasso). We serve with feta and enjoy! Thanks for sharing Daphne! Great winter meal. Can you make it with brown rice? Yes, you could but, you want to make sure you cook the rice long enough without overcooking the spinach. I find brown rice always has a bite to it, so may not necessarily the best choice here as you want a creamy texture. I was wondering how the recipe would be with frozen spinach. My second question : is spinach available all year round in Greece? Many thanks! Almost year round, except in the summer months. Although I try to eat seasonal. Frozen spinach would not have the same flavor or texture, I really recommend using fresh for this recipe if you can find it. My Mom always made it with frozen spinach and so do I along with the tomato paste and no mint just a little dill! Her family was Spartan. My dad’s Mom made it without the tomato paste, she was from Crete! Either was it’s good and the best comfort food dish! Thanks for sharing. Yes, the tomato paste is a funny thing: my mom uses tomato paste, but my grandmother (her mom) did not. I think I’ll give it a try with kale. I bought quite a bit of it yesterday and I think it should work. I hope so anyway! It should work Sherry, it will just have different flavor profile. What kind of rice do you recommend? I’ve read elsewhere that arborio works well for spanakorizo. Arborio should work fine. You are looking for a medium grain rice -arborio is a short grain rice but works well. I intended to eat half of this as a full meal but ended up eating the whole thing, as it was so good! Ah well, it’s healthy enough to splurge on and not a terrible number of calories. My mother and I always added stewed tomatoes, and personally I can even eat it cold. Great with fish and pork. I’ve made this every week since first reading the recipe. It’s so good! Thank you!! First I want to say thank you for this website, it’s been wonderful in gaining knowledge on the Mediterranean diet. I did wonder though, there seems to be a lot of white rice/pasta/filo pastry. 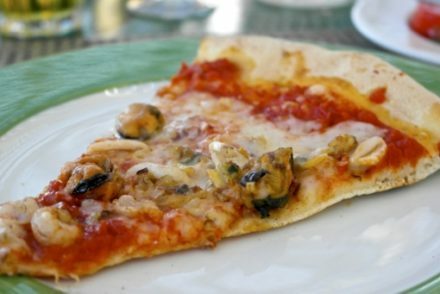 How often would pies or white rice and pasta be eaten? We’ve been taught that whole grains are better because they offer more fiber and do not convert into simple sugars as quickly, thus maintaining more constant blood sugar levels. Can you provide any insight on this? Thank you! Hi Nicole, Rice or pasta dishes I would say on average are consumed about once (sometimes twice) a week. Regarding the pies, this type of phyllo is quite thin. One piece of a typical pie wold correspond in terms of phyllo, to a half slice of bread. The first step of the cooking process, am I adding any water to the lemon and olive oil to wilt the spinach? Hi Kellie, No you do not need to add water. I’ve only ever had this dish with tomato; maybe that’s why I’ve never liked it! Always felt too heavy on the stomach and gave me nausea. I didn’t know you can make it without tomato and I am very excited to try it this way, so thank you! in the recipe it adds just the right amount of flavor. I’m not sure why, but my Cretan mother used Uncle Ben’s Converted rice for all her Greek recipes, including spanokorizo and spanakopita and in Gourvalakia. This is great food.We make it everything week or so . Adding a handfull of shrimps makes it even better! Shrimp! Sounds interesting. Will try it! I was wondering if I could make this using rice pilaf in place of plain rice…..I really look forward to trying this recipe and thanks for providing this great source of information. Hi Dee, Do you mean long-grain rice? It will not provide the creamy risotto-like texture. Made this last night to go with Greek meatballs and it was great. I added some garlic but didn’t change anything else. My husband and I enjoyed this for lunch today! He said he would like it better as a side dish, than as a main dish as I served it (I guess too much of a good thing for him, lol). It was fabulous! Would have been terrific with grilled chicken, etc. I went out and bought medium grain rice, and everything – and presume maybe it made a creamier dish like risotto, and stirred it often, adding more water. I was afraid to put the tomato paste in, and possibly “ruin” it. What is the verdict or practice that is most common, with the tomato paste? Hi Nancy, Tomato paste is fine. My mother adds it. It will add a slight reddness to the dish. I am going to try this but use crumbled cauliflower in place of the rice. Yummm! Made this with whole wheat pastina instead of rice. Elena, I have made almost all your vegetarian recipes for my family and we just love them. As a full time working mom I’m always looking vegetarian recipes that are not labor-intensive but are nutritious– you deliver every time. My spouse and my 1 year old love every recipe we’ve tried. Thank you so much! Thank you Leila! I appreciate the feedback! Thanks! I will be posting a dolmades recipe in the future. spanakorizo as a base for stir-fry – with or without meat/chicken – is delicious; a combination of culture-cooking, it is colourful & very healthy. Do you precook rice? And when do you add the onion? Hi Eleni, No you do not precook the rice, it cooks with the rest of the ingredients for 20 minutes. For the onion in step 3 you add spinach etc. in the pot that you have sautéed the onion. Is the rice washed and uncooked when added to the wilted spinach? Can you use canned tomatoes with herbs instead of tomato paste? Yes, the rice is uncooked when added to the spinach. You can add a small amount of canned tomatoes, not too much -you don’t want the dish very tomatoey, you do not even need to add any tomato. I have been looking for a spinach and rice recipe for a very long time. I am originally from Toronto and about 40 years ago started going out to a Greek restaurant on Pape Ave. I think it was called Ella’s just north of the Danforth. They had an “open kitchen” and that was one of my favourite dishes. I look forward to trying your recipe soon. I had this in Greece and LOVED it. Since then, I’ve tried a few recipes, but none of them were the same….can’t wait to try yours! Do you use fresh or dried dill in this recipe? If you’re using fresh, any idea how much dried I should try? Thanks!! What if I used long grain brown rice….will it be a disaster? Hi Pam, It most likely not have that smooth texture since brown rice has more of a “bite”. I just made this for my kids tonight. It was a huge hit with my 8 yr old. I served it with some rosemary bread, potatoes sauteed in olive oil and garlic and green beens. He said it was really good. I did put out cheese but he’s not a huge fan of cheese right now. Thanks for the great recipe. I’ve Bern looking for a better way to serve spinach. It was delicious! Hi, Can I use white basmati rice? not sure what a “medium” rice is…. looking forward to trying this! I just made my first recipe from your website, Greek Spinach and Rice. It is delicious! Tomorrow I’m making the Greek Green Beans, and then the Lentils. I shared your website with my doctor who is a D.O. and all about healthy cooking. She is excited to try your recipes too! Thank you Kathy! And thank you for sharing! I always use cooked brown rice for this recipe. I also add some crushed garlic and use frozen spinach. My husband loves it. He is diabetic and cannot eat white rice. Believe me it turns out very good. Is this good the next day? I’ve been trying to incorporate more greens into my diet, and this was just wonderful. It tasted so vibrant and fresh, even using brown rice. 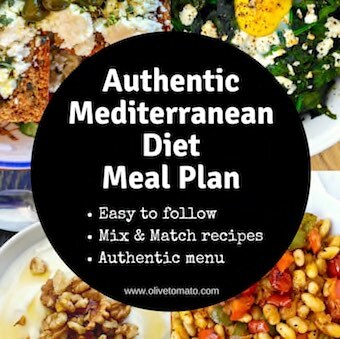 I am new to the Med diet and so delighted to find this website. I made this Spanakopita and fell in love. I love lemons so that’s why I tried this recipe first. Even my husband who doesn’t like spinach ate his full share and agreed to have it again. I omitted the tomato & feta and used Parmesan & pine nuts. Thank you for sharing Ann! Welcome! Hello; I’m new to your site and wanted to say thank you, this dish is absolutely delicious and incredibly filling. I have also prepared the Barley Rusks and it was delicious and crispy this morning with greek yogurt and tomato. I am so glad I found your site!